SEIAD VALLEY, Calif.—One morning in early May, a group of several dozen forest defenders, river advocates, and members of the Karuk Tribe gathered on a logging road in Klamath National Forest in northern California. Brandishing megaphones and a wide banner reading “Karuk Land/Karuk Plan”, they created a blockade against one of the myriad clearcutting operations currently active in the region, collectively known as the Westside Fire Recovery Project (WFRP). “Think about what you’re leaving your kids for the next generation,” one of the protesters shouted at two loggers retreating from the scene. “We’ll leave them a lot of stumps,” one of the loggers called back. The U.S. Forest Service launched the WFRP at the end of February in response to the 2014 wildfires that hit the region—the agency is currently auctioning 5,800 acres of public land in Klamath National Forest to private timber companies for clearcutting purposes. The project is part of a larger problem in California, in which dead trees—there are now 66 million of them—are falsely presented to the public as a fire hazard in order to help authorize seemingly innocent fire recovery projects. On the surface these projects look agreeable: clearcut the grotesque, ash-laden trees and replace them with sprawling evergreens. But according to scientists, leaving these dead trees in the ground helps the land regenerate naturally, thus reducing fire hazard and keeping the forest resilient against the perils of climate change. Many argue that these fire recovery projects actually exacerbate the climate change impacts that the 2010 United Nations Cancun agreement promised to curb, including forest degradation, loss of biodiversity, and desertification. Locally, the northern California protests are also taking place because many fear these clearcuts in Klamath National Forest will also affect critical watersheds and salmon bearing streams, threatening water quality and possibly leading to the local extinction of the region’s endangered coho salmon. To address this problem, on March 3rd the Karuk Tribe and four prominent conservation groups—the Environmental Protection Information Center, Klamath-Siskiyou Wildlands Center, the Center for Biological Diversity, and Klamath Riverkeeper—filed a joint lawsuit against the USFS and National Marine Fisheries Service in condemnation of the WFRP. They claim the project violates the Northwest Forest Plan (NWFP), the policy which governs federal land use in Northern California. These claims are backed by one of the authors of the NWFP, Dr. Jerry Franklin, who issued a scathing letter to the USFS asserting that the trees targeted by this project are critical to the forest’s ecosystem and provide habitat for endangered wildlife species. Because clearcutting eliminates crucial wildlife habitats, the USFS has secured permits authorizing the likely death of 103 northern spotted owls within this logging project. “We’re not even sure there’s 103 spotted owls left in the entire Klamath National Forest," said Craig Tucker, a policy advocate and campaign coordinator for the Karuk Tribe. The forests targeted by the WFRP are called late-successional reserves (LSRs), and are ecologically valuable. Characterized by their chaotic appearance, LSRs are populated by trees of all different species and sizes, erupting from a dense foundation of flora to create a productive and symbiotic ecosystem. According to George Sexton, conservation director of Klamath-Siskiyou Wildlands Center, the mission to conserve these unique forests was one of the reasons the NWFP was created in the first place. In fact, according to Franklin, the USFS’s mission to reap “economic benefit” from this forest is in direct violation of the WFRP, which specifically directs that "salvage will not be driven by economic or timber sale program factors" in LSRs. "Non-violent direct action is likely to be necessitated because the Forest Service has given people no choice." Kerul Dyer, communications director for Klamath Riverkeeper, worries that continuing to justify clearcutting projects with these blatantly deceptive claims will have dire long-term impacts on local ecosystems and communities that depend on them for their livelihoods, such as the Karuk Tribe. The Karuk Tribe has asked the USFS to consider an alternative logging plan that contains no clearcutting and emphasizes forest management but would still allow local timber companies to profit. The USFS’s refusal to embrace this plan has created significant backlash from communities in the Klamath region. “Non-violent direct action is likely to be necessitated because the Forest Service has given people no choice,” said Dyer, who is currently working with the Karuk Tribe on protest efforts and preventative strategies. The USFS has recently increased security measures around the forest, making it more difficult to stand in the way of clearcutting operations. 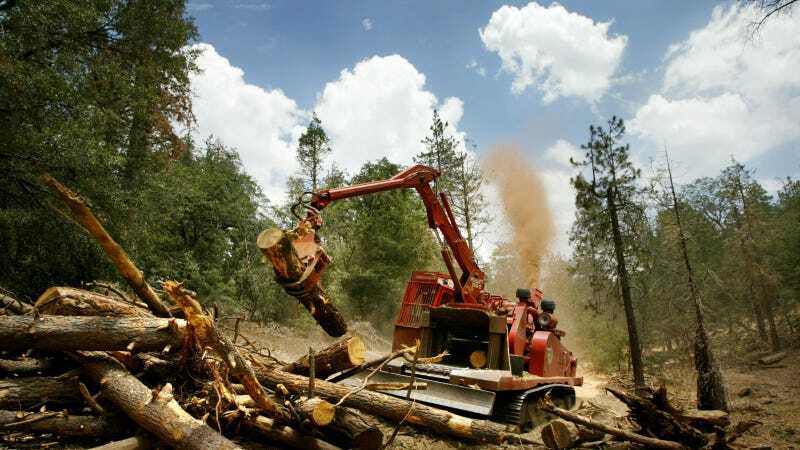 The Karuk Tribe’s request for the courts to order a pause on logging while their case is reviewed was also denied, meaning clearcutting will continue throughout the legal process. According to Shackleford, most or all of the salvage logging will occur this year. Unless non-violent direct action can stall logging, the forest could be gone by the time the court reaches its verdict.